Sometimes a vacuum robot just won't cut it. Dried pools of dog drool, coffee spills, and pasta-sauce splatters can thwart even the fanciest robo vac. 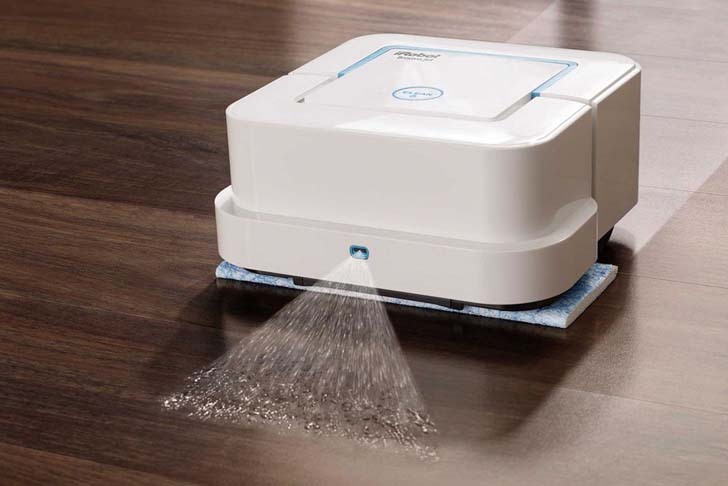 Instead of sucking, iRobot's automated Braava Jet 240 tackles floor gunk using water-activated cleaning pads. The Braava Jet runs on a removable lithium-ion battery, which needs an initial two-hour charge before you can send the bot off on cleaning duty. 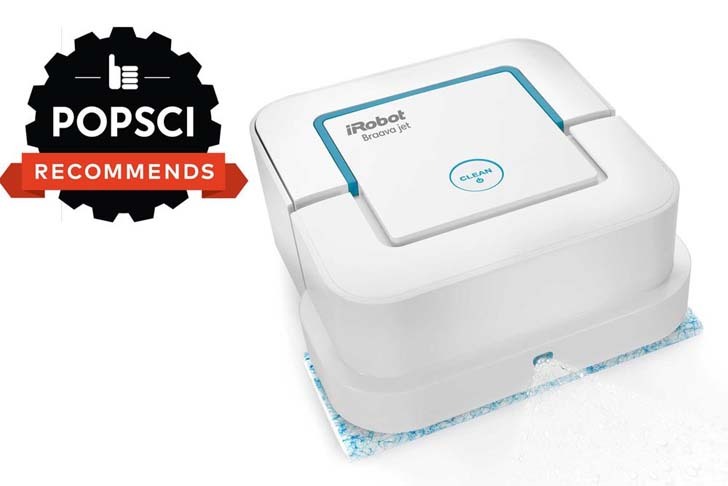 While you wait, you can also download iRobot's standalone app; it's not mandatory, but gives you access to a few custom options, like a spot cleaning mode and control over the amount of water the scrubber uses during cleaning. [post_ads]The bot comes with three kinds of cleaning pads: a blue one for wet mopping, an orange one for damp sweeping, and a white one for dry sweeping. It'll automatically recognize the pad type you load and use the appropriate corresponding cleaning pattern. As far as we can tell, the main difference between the three modes is how much water the Braava use (a lot, a little, and none, respectively), the sweeping pattern, and number of passes. Also, the pad vibrates in wet mopping mode. We set our test unit loose on an objectively gross 49-square-foot sealed wood kitchen floor, which clearly called for a triple-pass wet mop. So we loaded the Braava with one of the two included blue cleaning pads, set it in the left corner about a foot away from the walls, and hit the glowing "Clean" button. We did subsequent damp and dry sweeping tests on the same kitchen floor after creating our own artisanal messes consisting of dried soda, dog hair (it's shedding season! ), and some dirt from the backyard. We also had the Braava Jet clean our two bathrooms. With a week's worth of dinner prep debris on the floor, we were worried this initial mess would prove too much for the Braava Jet. To our surprise, the tiny 7-by-7-inch bot did a remarkably thorough cleanup job. The cycle took about 14 minutes, during which time the Braava Jet managed to sweep up the small bits of food, and eradicate all evidence of the liquid spills on the floor. While it had a little trouble with the dog hair (the bot managed to mop some of it up, but a fair amount it just pushed into the corners), the kitchen floor looked great overall. The wet-mopping pattern has the Braava Jet swing out to the left and right as it moves forward, occasionally squirting the floor with water. Once you start the cleaning process, it will do a double pass on the first row then move gradually from the left side of the room to the right, Zamboni-style. In our case, a thin carpet created a natural border separating the kitchen from the hallway, which the Braava recognized on its own. You can also set up a virtual wall via the app if no such barrier exists in your home. Repeat cleaning tests were equally impressive. Using the damp-mopping mode, the bot easily took care of all the dust, dirt, and grime in both of our bathrooms, maneuvering even into the tight corners around the toilet and sink. We tried out the spot cleaning option on a large, semi-dried pool of diet coke in the kitchen, which the Braava Jet was also able to mop up. You can start a cleaning by pressing the button or remotely via the app, but you can't schedule cleanings while you're away. [post_ads]While performance was consistently good across all cleaning modes, there are some key limitations to keep in mind. 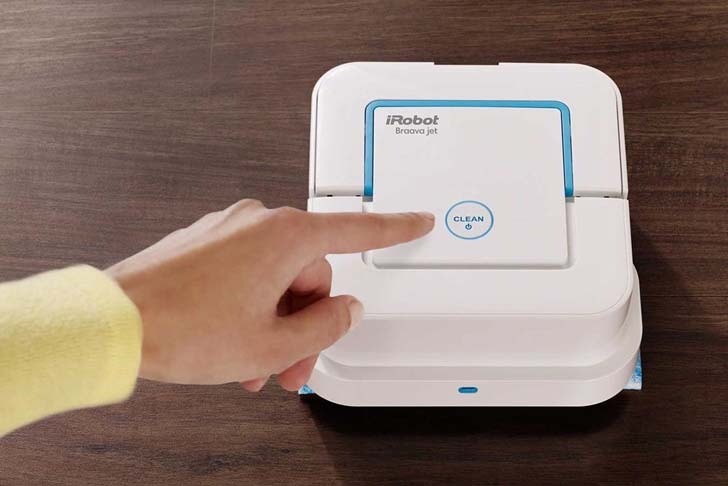 Unlike iRobot's more-expensive Braava 380t, which can sweep up to a 1,000-square-foot area and mop up to 350-square-foot one, the 240 has a more-limited range. It can sweep a 250-square-foot room and mop a 200-square-foot one in one session, according to iRobot. This wasn't an issue for our tiny rooms, but it's worth noting if you have larger hard-floor surfaces in your home or apartment. We didn't test them directly, but the Braava 240 also works with reusable, machine-washable pads (two for $20). If you plan on using the bot on a weekly basis and want to save a little money, investing in one is probably a good idea (a pack of 10 replacement pads runs $8, which could add up over time). Given that you can opt for a reusable pad, however, it would be nice if the reservoir was removable and could accept something other than water (like Bona or other cleaning solutions). It'll tackle some pretty gnarly messes, but the Braava Jet really works best as an incremental cleaner. It can’t completely eliminate scuffs and other stubborn stains, but, for the cleaning averse who live in smaller homes and apartments, the Braava Jet 240 makes a lot of sense. It's a relatively inexpensive Swiffer replacement that should significantly prolong the time between the inevitable deep cleanings all hard floors require.